Yoga while babywearing! Some top tips! Any Mum with a young child will know it is a challenge to find time for yourself. Practicing yoga with your little one is a great way to enhance your wellbeing as well as having fun with them. 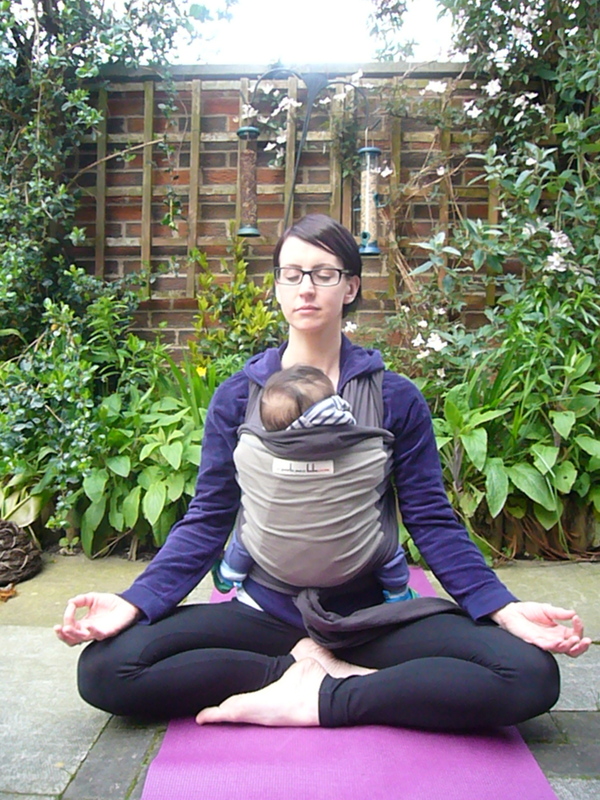 Another way is to do some yoga with your baby in a sling/ wrap/ carrier! (Also known as babywearing). 2. Use a quality sling that is adjusted perfectly for you. Get advice , eg from The Sling School Manchester (www.theslingschool.com). My personal preference is stretchy wraps and woven wraps; basically a long bit of (specialist) material which you wrap around your body and the baby. Fits perfectly, spreads baby’s weight evenly over your back and torso, and no sticky out bits to get in the way! Pictured above is the ‘Je porte mon bebe’ , borrowed from the Sling library via the sling school! 3. Forward bends are obviously out of the question! Any move which puts strain on your body in the same way that your pregnancy did- ie pulling forward the lower/ mid back while weighing down the abdomen, is bad news. Bending over while babywearing needs to be done with wide legs, deeply bent knees, and bum stuck out ( sounds less graceful than it looks!!). 4. Standing poses – particularly Warrior poses, tree pose, side angle pose, arm stretches and yogic full breaths, are perfect. 5. Focus on breathing extra deeply into your chest , consciously expanding your ribs; good practice for babywearing in general and very strengthening for the chest and intercostal muscles as they have the extra pull of baby’s weight to work against. 6. Stick pose (sitting with legs straight in front of you) is good, ensure that you engage the abdominal muscles and flatten the lower back, don’t let it pull forward. 7. If you need the stretch for your inner thighs and hips, and if you use caution, loosely cross legged and butterfly (soles of the feet together, knees relax outwards)positions are good. Engage the core muscles to hold you steady and don’t overstretch. Be aware that your ligaments are probably still soft, if you are still breastfeeding and / or in the first few months after birth. Do not overstretch- ie dont go as far into the stretch as you would outside of the pregnancy/ postnatal period. Listen to and respect your body. 8. Relaxed walks / walking meditation, or seated meditation, are wonderful for calming yourself and your baby. They will hear and feel your slow and steady heart beat, your slow and deep breathing, and they will feel your good vibes! Babies relax deeply when parents do the same. 9. Outdoor yoga is perfect! Embrace and take inspiration from the elements. Previous post8 Days of living yoga: Days 7, 8 and beyond! Next postIntroducing Treetots Yoga !